Monitor is an occasional column written at the crossroads where the arts, popular culture and technology intersect. Listen to many of today’s bright, young and entrepreneurial things and you could be forgiven for coming away with the notion that every product we buy in the not-too-distant future will have been manufactured by a 3D printer from blueprints downloaded from the internet. The future, they say, will no longer be televised – it will be printed. 3D: Printing the Future, the title of a new exhibition opening this week at London’s Science Museum, lacks the questionmark a more sceptical or more cautious curator might have added, but the presentation itself seems open to the idea that 3D printing may not be the immediate future of manufacturing after all. It’s certainly easy to be wowed by the thought of punching out our own thingummies and doohickeys at home. As Jenifer Howard, marketing chief at Makerbot, a producer of desktop 3D printers, is quoted by the exhibition as saying, “3D printing has been around for over 25 years. It’s only recently that consumer 3D printing has become popular”. It has “inspired a creative explosion”, says exhibition organiser Suzy Antoniw. 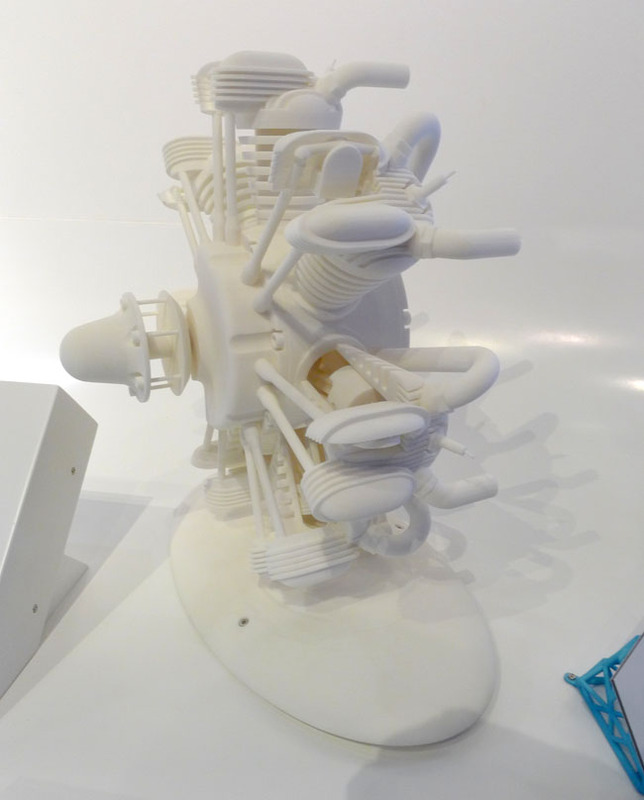 Additive manufacturing does indeed appear to be nearing the mainstream. Only last week, Dixons stores PC World and Curry’s announced they are now selling a £1,100 3D printer, the Cube, on their websites. Ordinary folk wondering what all the fuss is about, and what 3D printing might be able to accomplish, will have it all cogently explained by 3D: Printing the Future. 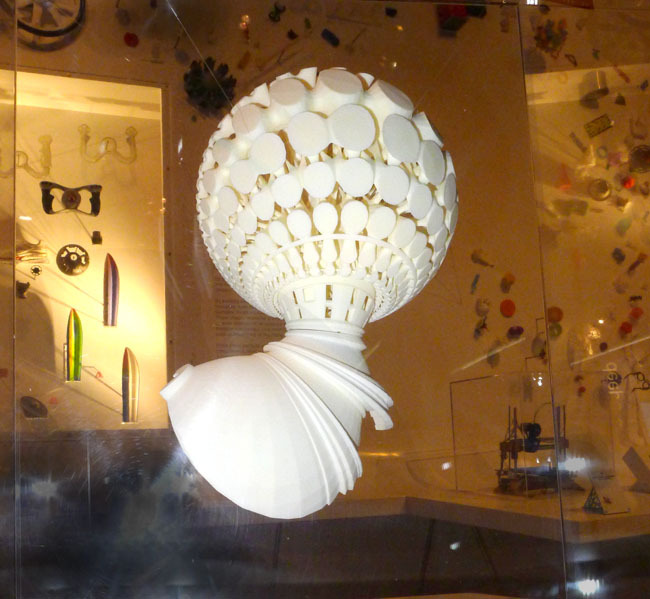 The exhibition’s centrepiece is a huge canvas to which more than 600 3D printed objects have been attached. Some objects model the biological, featuring: skulls, human, alligator and tyrannosaur, the latter modelled in miniature wireframe; the rippled surface of the brain; a selection of false teeth; prosthetic limbs and kneecaps. Others are architectural and mechanical: Notre Dame cathedral and Venice’s Campanile di San Marco; engine parts formed by combining 3D printing plastics with particles of steel; Bloodhound supersonic car steering wheels; many mathematical and geometrical shapes. There are rather a lot, however, of the chess pieces, human figures, sea shells, Iron Man masks and such you always see snaps of in articles about 3D printing, or in the windows of the world’s few commercial print shops. There’s one, iMakr, just around the corner from Vulture Central. Not a great deal of imagination being shown here. 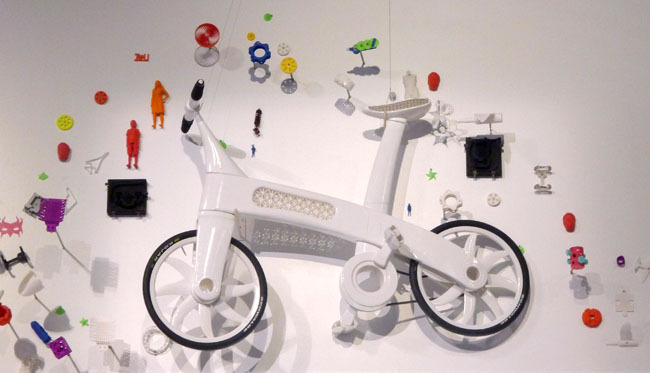 The exhibition’s selection of objects - ‘things’ as it calls them - is loosely tied to the three areas in which 3D printing technology is finding a home and around which the presentation is organised: industrial, medical and consumer, each of which has a separate selection of more relevant items. The medical section has perhaps the largest showing. No surprise, this, since the exhibition is housed in the Science Museum’s Wellcome Wing, funded by the Wellcome Trust, a medical charity. 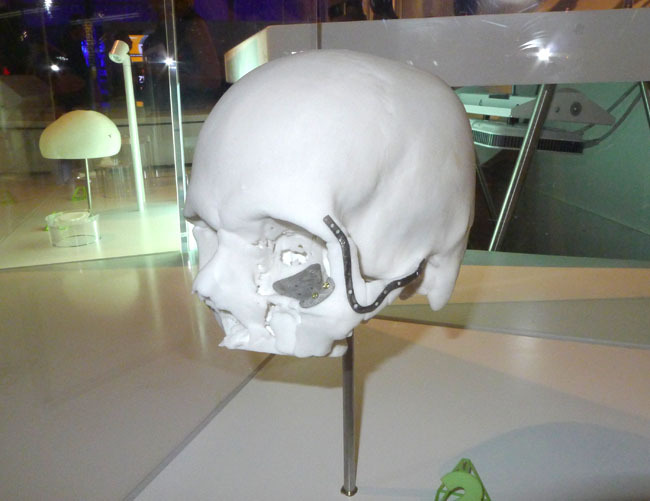 It presents prints from patients’ skulls, which are scanned and then digitally modelled before being output to aid surgeons’ efforts at reconstructive surgery. Other, less familiar objects are revealed to be foundations on which bone and flesh can be grown before being implanted to replace damaged or diseased tissue. For medics, 3D printing provides a way to create inexpensive implants tailored to each patient instead of fitting them with low-cost generic spares or expensive tailor-made ones, says curator Suzy Antoniw. Among the exhibits is a concept prosthetic forearm and hand, developed by a team at Nottingham University, itself something of a 3D printing powerhouse and a contributor of many of the exhibition’s objects. Would you ride a printed bike? The arm truly signals the emerging nature of 3D printing: many of the applications discussed here are conceptual. The technology exists, but no one quite knows what to do with it, or whether it’s able to deliver the solutions they think it might be able to. How about printing flexible cellular material? Derby’s words aren’t the only ones to express reservations that 3D printing might not be about to trigger a medical or industrial revolution. All of the exhibition’s interactive information panels contain quotes from some of the industry’s more cautious participants. In fact, 3D: Printing the Future unintentionally reveals there are two 3D printing worlds: the one in which engineers and doctors are carefully working toward real, practical and useful goals, and one inhabited by ebullient enthusiasts with a less considered view of the potential of 3D printing. It’s clear from the exhibition that medical and industrial applications are emerging but slowly, as practitioners experiment with the technique to see what it may be able to achieve. It’s certainly happening – more than 5.5 million people around the world have been treated using 3D printed parts, we’re told – but it’s a revolution waiting to happen. Next page: Best thing since sliced bread, or a technological appendix?